Maine gained its statehood in 1820 and has a large percentage of French ancestry. Obviously English is the dominate language, but the French influence can be felt. While driving through the state, auto transport drivers may get some nice mountain views. The Appalachian Mountains are spread across Maine with the highest point on Mt. Katahdin at approximately 5,270 ft.. One get-a-way spot that attracts the well to do is Kennebunkport. It belongs to York County and is just south of The Greater Portland area. This particular destination of retreat had the former president, George H. W. Bush (41), coming back every year to vacation. Kennebunkport is also ideal for Maine car transport. 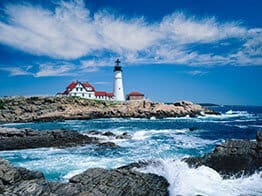 There is one and only one interstate highway in Maine and it is I-95 which traces the coastline all the way to Canada. That’s it folks. So if an auto transport customer does not live within close proximity of I-95, how likely is it that his vehicle will ship anywhere, anytime soon? Not very likely. Even if shipping a vehicle from Portland, it can be touch and go. It depends on where the customer is shipping? If the destination is remote, then it becomes harder to amalgamate 8-10 automobiles to ship. It’s difficult anyway putting together a full load to someplace easy like Florida, Dallas, Chicago or Los Angeles. Now imagine trying to start out still farther north in Bangor? Think that car is shipping anytime soon? Probably not … and it’s nothing personal folks. We want to do it fast and sometimes get lucky and do. But more times than not, auto transport orders out of Maine are a bear to move. Just for kicks, imagine shipping a vehicle from Billings, Montana to Bangor, Maine, two very cool places. What are the chances eight other people are also shipping their cars? We just ask for patience and understanding when shipping to or from Maine. You can call us to discuss your chances at 800-600-3750 or visit Direct Express Auto Transport to fill out a simple form and get a free car shipping quote. We make it easy to book your vehicle shipment online. Despite the dose of sober truth about Maine car transport, we never-the-less get it done eventually.